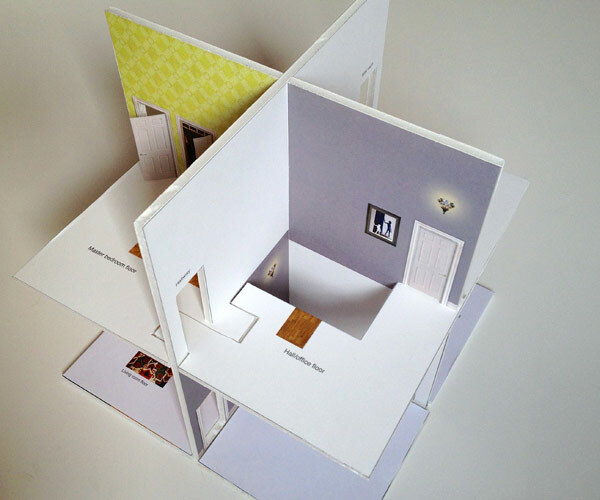 To assemble all the rooms of your pop-up paper house you will need to build a supporting structure. Use the PDF template in this download to build your own lightweight foam core structure. Foam core, available in any art supply store, can be cut easily with your scalpel knife. This design fits together to create a sturdy structure without any glue, nail or screw, which means you can also pull it apart for flat storage or travel, as you can see in the video of the completed structure below. This template is designed to be used with 3/16″ thick foam core, but it can also be used with any sheet material up to 1/4″ thick (perhaps with a little extra filing to get the pieces to fit together smoothly). The download comes with illustrated instructions, and three versions of the same template formatted to be printed on different sized paper. The tabloid format (11″ by 17″) is preferred, but if you do not have access to a large format printer either the letter or the A4 template can be used. This entry was posted by KB. Bookmark the permalink.